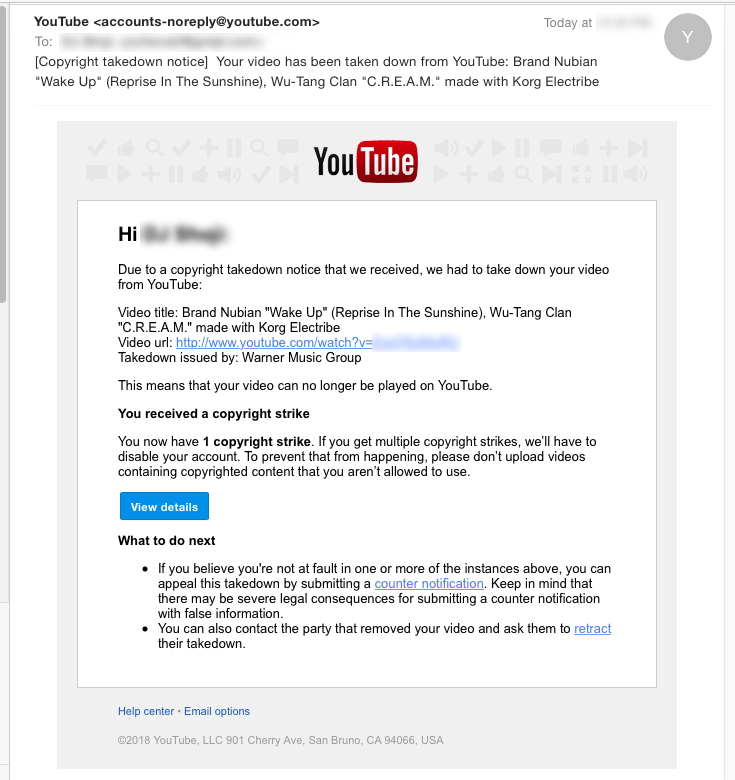 The takedown request was issued by Warner Music Group. You now have 1 copyright strike. If you get multiple copyright strikes, we’ll have to disable your account. To prevent that from happening, please don’t upload videos containing copyrighted content that you aren’t allowed to use. If you believe you're not at fault in one or more of the instances above, you can appeal this takedown by submitting a counter notification. Keep in mind that there may be severe legal consequences for submitting a counter notification with false information. You can also contact the party that removed your video and ask them to retract their takedown. The clip was pretty old one, I believe that it was uploaded in 2010. Note that it was recreated beat, using original samples used for Brand Nubian "Wake Up" (Reprise In The Sunshine mix) beat, and Wu-Tang Clan's "C.R.E.A.M" beat. They might have all rights of both sampled songs, Wu-Tang Clan and Brand Nubians'. Be careful, It might happen to you next. This is part of the reason I don't upload hip hop beat remakes anymore. Do you have the video monetized? richie wrote: Do you have the video monetized? No. In fact, I haven't monetized any of my videoclips on YouTube. Most of my clips involve with samples, so I wouldn't do that anyway.